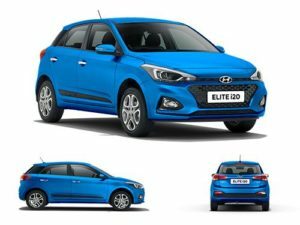 Hyundai India, the country’s second-largest automaker, has finally taken the wraps off its latest iteration of premium hatchback i20, which has been re-christened as ‘Elite’ i20. Along with its keenly-awaited India launch, the Hyundai Elite i20 has made its global debut, as the hatchback was never showcased before in any part of the world. The Elite i20 is blessed with the company’s latest design direction – Fluidic Sculpture 2.0 and is the first India-bound vehicle to adorn this new design philosophy. The hatch has a European feel and flair along with the highly sporty and innovative design; although Hyundai Elite i20 misses out on a few features that the earlier hatch used to flaunt, it still is desirable and tempting. Hyundai Elite i20, similar to the phased-out model, has been presented in both petrol and diesel fuel trims. There are five variants with every fuel trim – Era, Magna, Sportz, Sportz (O) and Asta. The Asta (O) variant, which was the top-end trim in the outgoing model, has been eradicated with the next generation i20. Hyundai has worked extensively hard on the exterior and interior of the new hatch in order to ensure super sporty appearance and elegance inside the cabin. Although it lacks an automatic variant and 1.4 L petrol motor, the company is contemplating to launch it after seeing the initial response of the customers. The drivability has been improved significantly and the NVH levels have been tuned down to produce lesser noise in the next gen Elite i20. Check for Car Loan Interest calculator. Hyundai believes the previous generation i20 had a youthful, sporty and hi-tech stance and now while retaining the same characteristics of the styling, they are promoting the Elite i20 with a bold, dynamic and powerful image. We agree with them because it looks powerful indeed and has mature design elements that grow on you with time. The front profile looks imposing with the hexagonal grille having a honeycomb mesh and chrome outlining. The wide swept back headlamps integrate reflectors on the top that act as faux daytime running lights because DRLs are not being offered with the new gen i20 as opposed to the outgoing model. The bonnet has strong creases that add to the visual appeal. There is a pause between the bonnet and bumper on the nose that houses the Hyundai badge neatly. At the lower end you’ll find trapezoidal fog lamps with sharp bumper lip. The side profile reveals the sporty stance of the Elite i20, which appears forward leaning. The 16-inch ‘diamond cut’ alloys look premium and fill the wheel arches very well while the ORVMs have integrated turn indicators. There is a strong shoulder line that emerges from the headlights and continues upwards to the tail lights. The blackened B and C pillars gives the sense of a floating roof and we quite like it but it is a ‘love it or hate it’ styling cue. It’s integrated neatly to the body but the panel itself feels plasticky and boxy when you knock it. That said, the rear styling of the Elite i20 definitely grabs attention with its broad stance and big car feel. The three step detailing on the huge tail lamps looks upmarket and the bumper gets busy styling integrated with reflectors and one side reverse lamp. The rear parking camera is protruding in the middle and further down is the hatch opening button. The Hyundai logo integrating the button with a hidden camera would have made the tailgate look cleaner. The Elite i20 is 10 mm shorter and 24 mm wider with a 45 mm longer wheelbase. The assistance fortunately is not excessive and like in the Verna or the previous i20, you do not need to be extra cautious when taking the steering wheel off centre.Compared to the diesel variant, the petrol i20?s steering setup feels lighter, thanks to the lesser weight of the petrol engine. But that also makes the steering feel more lifeless. The engine however, feels livelier than its diesel counterpart. Being a naturally aspirated mill, it has a more linear power delivery with no flat spots to complain about. The engine is rev happy and gets the car rolling from as low as 1,200 rpm. Needless to say, it is also quicker and more refined than its diesel sibling. Hyundai has incorporated a decent braking system in the hatch, which consists of disc brakes on the front and drum brakes on the rear. It is supported immensely well by the Anti-lock Braking System (ABS), but that is limited to the top three variants. Earlier, Hyundai i20 used to be the only hatchback under Rs. 10 lakh that offered as many as half a dozen airbags and was impeccably safe. But, now the scenario has reversed as even the top-end trim has only 2 airbags. The base and mid variants don’t feature a single airbag, while the Sportz trim comprises of only driver’s airbag. The parking assist feature with reverse parking sensors and rear camera with ECM display comes handy during parking the hatch. There are front fog lamps to improve visibility in inclement weather conditions.But, again, both the aforesaid features are with Sportz and Asta trims. Additionally, the top-end trim also features seat belt pretensioners for the driver and front passenger, automatic headlamps, impact-sensing auto door unlock and clutch lock. On the security front, it has immobilizer, smart keyless entry, and central locking (door and tailgate) to endure any event of burglary or thievery. It can be propounded nonchalantly that the current gen Elite i20 stands nowhere close to its predecessor in terms of safety features. The company has disappointed thoroughly in the safety and security aspect. Hyundai Elite I20 On-Road Price in Pune ranges from 6,58,642 to 11,12,357 for variants Elite i20 1.2 Era Petrol and Elite i20 1.4 Asta Option Diesel respectively. Hyundai Elite I20 is available in 10 variants and 8 colours. Below are details of Hyundai Elite I20 variants price in Pune.